Covered in chalky concrete, oil-polluted streets and glistening steel and glass towers, Thailand’s capital is not renowned for having many green spaces within its CBD. 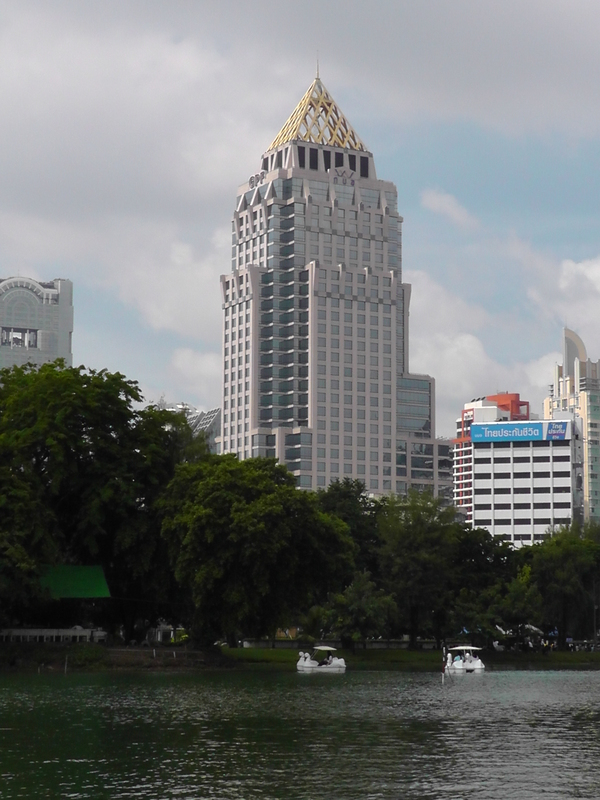 However, as with many other great cities around the world, Bangkok does have its own central park and, as with some of those other cities, Bangkok’s park offers a very welcome escape from the everyday toil of big city life. 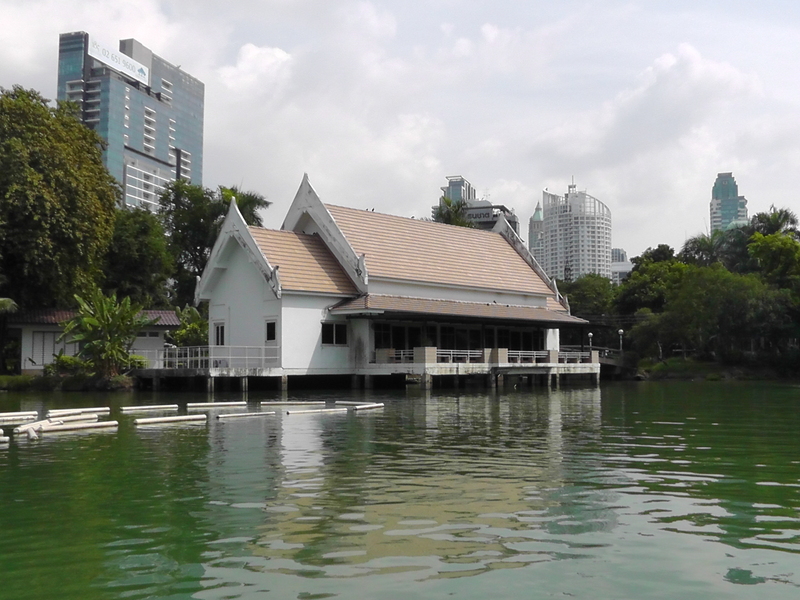 Lumphini Park (sometimes also spelled “Lumpini”) is 58 hectares of green space located in what has today become the very centre of Bangkok. It effectively sits in between the twin CBDs of Sathorn/Silom and Ploenchit/Sukhumvit. 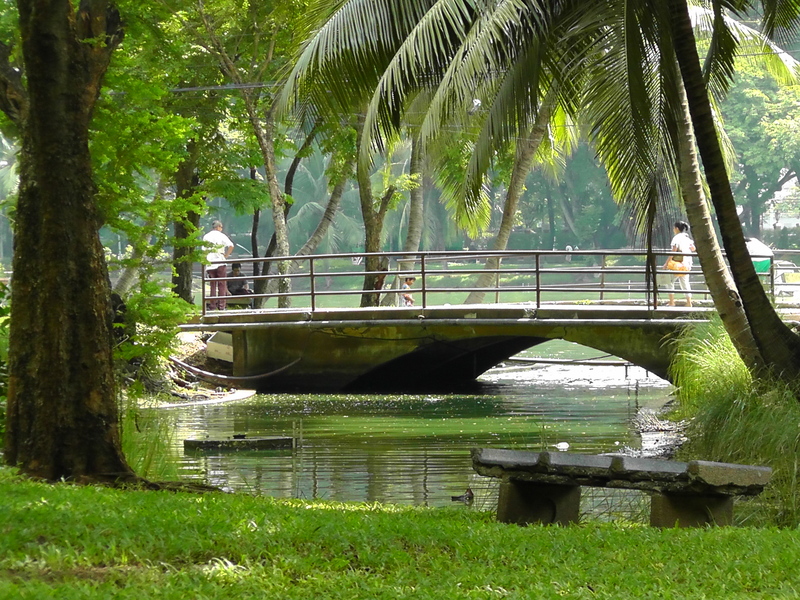 As such, the park sits on some of the most valuable land in Bangkok. Fortunately, the Thais are proud of their park and make good use of it, with activities ranging from gentle strolls, to aerobics, cycling, paddle boats, gyms, badminton, all the way up to takraw (a type of volleyball where you cannot use your hands) and political protests. Lumphini Park started out life as Sanam Sala Daeng, or Sala Daeng Field, back in the early 1900s, when it was royal land located on what was then the eastern outskirts of the city. King Rama VI had some of the land developed to become an exhibition centre to show-case Thai culture, including Thai handicrafts and orchids. By the early 1920s, the King decreed the land to become the first public park in Bangkok and it was renamed to Lumphini Park, in honour of the Buddha’s birthplace in Nepal. In honour of its founder, there is a large statue of King Rama VI at the south-west entrance to the park. Lumphini Park is roughly a rectangular shape, with a large brick and spear tipped wrought iron fence surrounding it. It’s main entrance is at the south-west, just after the Rama VI statue. There aren’t too many other entrances into the park, but in addition to the main entrances, the others are approximately as follows: west (at the midpoint of the western fence); north (a small gate that is fairly close to the north-west corner); east (fairly close to the northern corner); the south-east corner; and the south (over a concrete bridge at about the mid point of the southern fence). In addition, the main car-park is along the western side (entry off Ratchadamri Road). There used to also be public parking on the south-west corner but the area around the statue has been renovated and the car park removed. Inside the park, the main geographic feature is a lake with an island in the middle, and various canals leading off the lake and snaking around the park. In addition, there are jogging and cycling paths snaking around the park, including the main boundary path. If you are walking on the paths (particularly the boundary path) keep in mind that the larger part of the path has actually been marked off for cycling, so be wary of getting in the way of cyclists and look before you walk across a path. Free gyms – There are three outdoor gym areas that offer basic (but sufficient) facilities for free. Fitness clubs – There are also paid gym facilities. The plushest is an airconditioned fitness club located at the southern boundary (near the southern entrance). Paddleboats and row boats can be hired from two locations on the main lake. 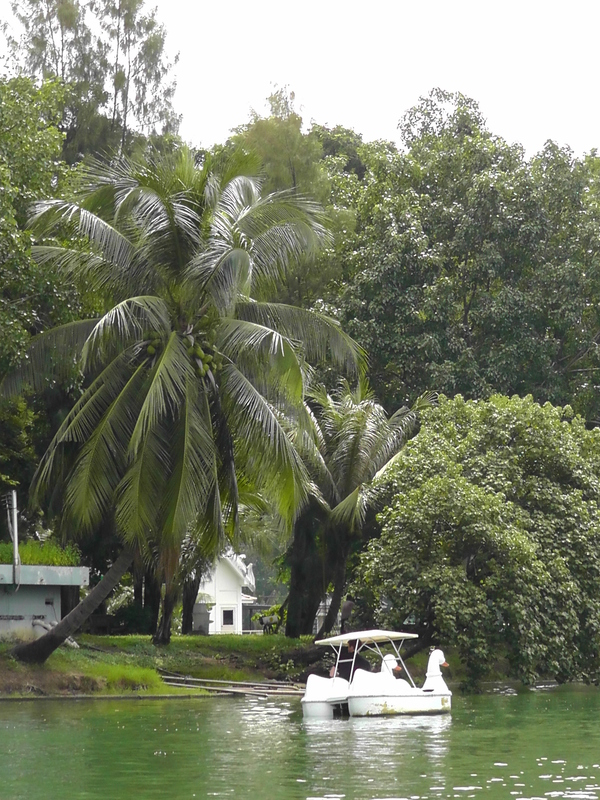 Hire fees are about 40 baht per half hour, but you need to provide a deposit of an extra half hour (ie pay 80 baht, and you receive 40 baht deposit if you get your boat back within half an hour). I quite enjoy the paddleboats because you get a different viewpoint and closer to the wildlife. 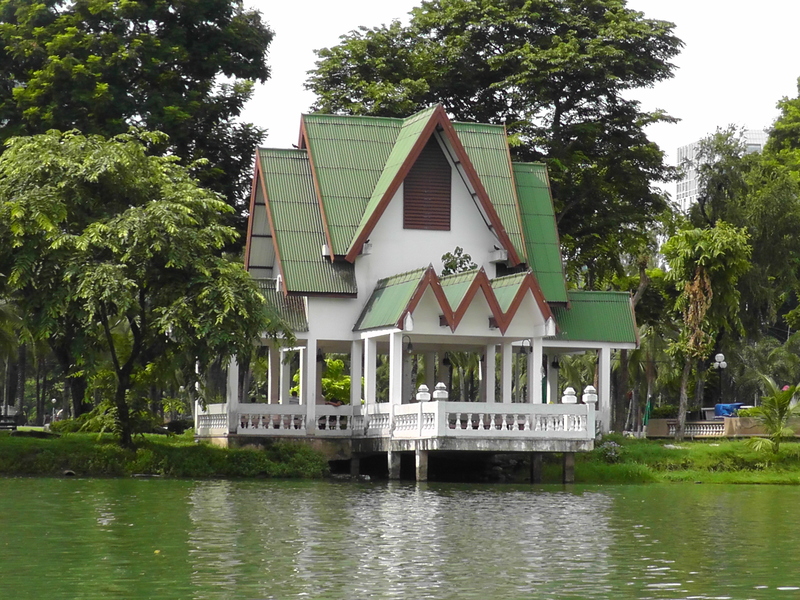 Lumphini Park Library – yes, there is a public library at the park. However, this is unlikely to be of much interest to westerners as most of the books are in Thai. Playgrounds – There are some good playground facilities scattered around. The best is at the north/central point of the park, just east of the main lake. Wildlife – The park is a great place for bird and wildlife watching. In addition to interesting bird species, there are also turtles, snakes, eels, cat-fish, carp, and large monitor lizards. Sports – Big free aerobics groups set up a bit east of the main entrance each morning and evening. In addition, there are plenty of Thai-Chinese practicing Tai-Chi, who would be happy to teach you. You can join in on a friendly game of takraw just near the large playground in the centre of the park; or bring your own gear for badminton, cycling or rollerblading (however, please follow the park rules and hours for cycling and rollerblading). Kite flying – In March, the wind picks up in Bangkok and Lumphini becomes a great place for kite flying the open fields around the south-west corner become full of novice kite flyers (and kite sellers). If you are lucky, you may even witness Thai style kite fighting. In terms of food and picnics, Lumphini offers everything you need. There are small Thai style restaurants set up in a few areas inside the park where you can dine on authentic Thai food. In addition, you can hire a mat and purchase some food from the mobile vendors and make your own picnic. There are also a few small kiosks (south-west and north-east corners are the ones I can recall) that sell water, soft drinks, energy drinks and snacks. However, these places tend to be a little over-priced compared to 7-Eleven. 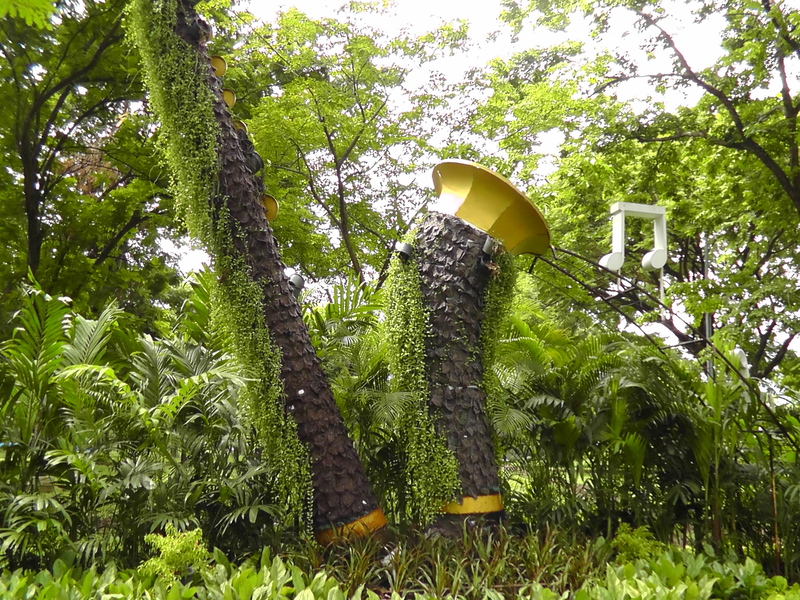 Lumphini Park is located at the intersection between Ratchadamri Road and Rama IV Road. 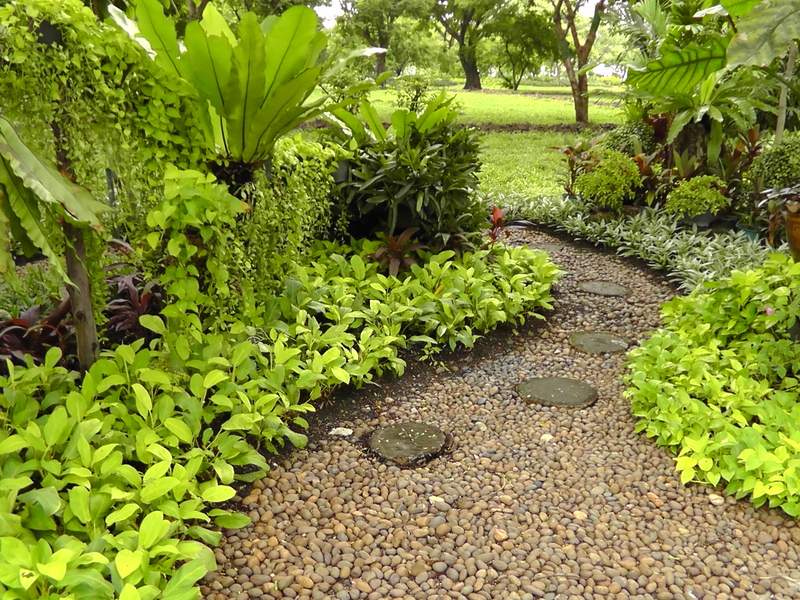 It is also bordered by Sarasin Road to the north and Withayu (Wireless) Road to the east. Entry is free and the park opens between 4.30am and 9.00pm. With the exception of the cool season (November to February), I would avoid visiting the park in the middle of the day. It can get quite hot and sunstroke is a risk for those not used to the humid tropical heat of Thailand. Lumphini Park is central and easy to get to. In fact, many people will be staying at hotels or apartments within walking distance. The easiest method is to get the subway (MRT) to Silom station and then exit into the park, which puts you at the main entrance. You can also get off from the MRT at the Lumphini station, but be very careful because you can easily take the wrong exit and then end up with a long walk before you find an entrance into the park (hint, take the north-west MRT exit, cross Withayu (Wireless) Road and you should be at the south-east park entrance. 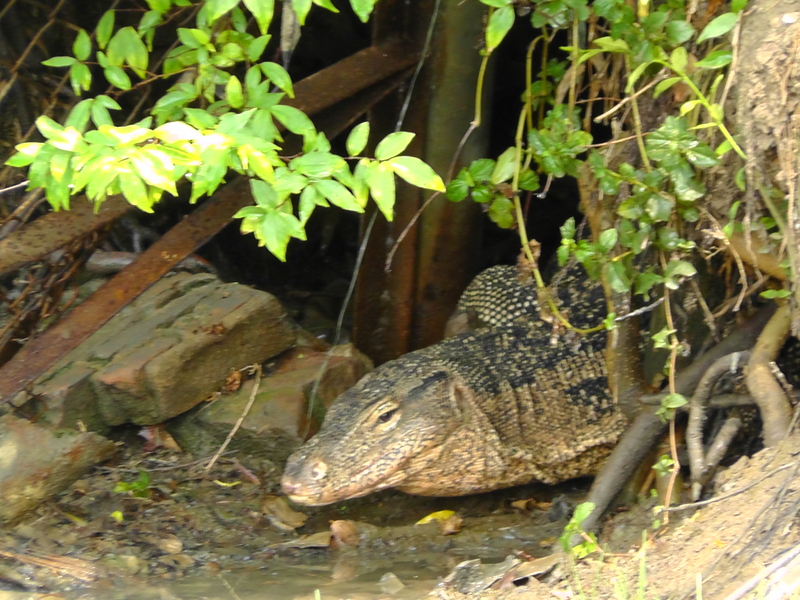 Monitor lizard. Some of these grow to 2m long, but do not attack humans. If you are taking the sky train, you do not need to transfer to the MRT. Instead, take the sky train to Sala Daeng station, and then take the elevated walkway north (follow the signs for the MRT or Dusit Thani). You will soon see the intersection between Silom and Rama IV roads and across it the main entrance to the park. If you don’t want to risk walking across Rama IV road (it is a bit scary at times), you can simply walk down into the MRT station, but instead of going through the electronic gates, follow the walkway to your right until you see the MRT exit up into Lumphini park. Lumphini remains my favourite public park in Bangkok, and I continue to spend a lot of time there, getting a bit of exercise and just enjoying a temporary retreat from big city life. In more recent times, some of the more hard-core cyclists detract a little from the overall ambiance, but other than that, the main park hasn’t changed a whole lot over the years. I highly recommend it as a temporary retreat for everyone, especially in the evening.